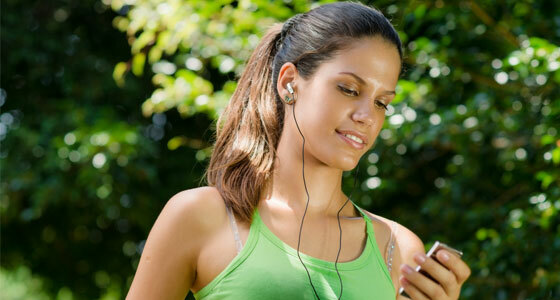 Does listening to music make you run faster? New study has the answer. – Is it healthful? You’re ambling along, until suddenly your favourite song comes on. Your beat, your jam, your rhythm! What was once a leisurely stroll becomes a shoe scuffing sprint. Are you going insane, or does listening to music make you quick? Like, super quick. Well a new scientific study has the answer for you. In this study a small group of runners went for, you guessed it, a run. The group were assigned to run with either fast music, slow music, or God forbid, no music. Those that listened to fast music ran at a faster pace, achieved a higher peak heart rate, but didn’t feel like they were working any harder than the other groups. Therefore, based on this study, fast music may directly improve your sport performance, or at least optimise your training sessions, indirectly improving performance. Our verdict: moderately healthful, if your music is fast. Again not based on the strongest scientific evidence, but it’s definitely worth a try! I hope this has been healthful. Let me know your thoughts – are you quicker when you listen to music? I ran with music for the first 2 years I ran and last year gave it up after reading some articles in Runner’s World. 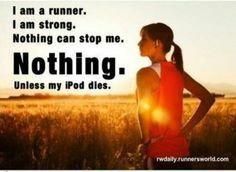 I think I like running without it, I can listen to my body more. Good one. Glad to hear from someone on the against running with music side. You’re a purist! When you’re in your groove you’re not concentrating so much on your actual work out so you can do it faster. Perhaps. Good to hear from you, Princessdoodlebug. Absolutely perhaps! Glad to hear it, Jenny! I wonder how music effects resistive exercise. Will music help you lift heavier or increase the number or repetitions? Will the loss of focus reduce the effectiveness of the lift. I laugh as I write this because I am nearly 56 years old and am the only one at my gym without ear buds. I have been training for 38 years. I have recently learned the definition of getting old. When the youth come up to me and ask my age, they usually say something like, “wow, you look really good….. for your age.” Twenty years ago those last three words weren’t added onto the sentence. Maybe I’ll go out and get a set of ear buds just so I can tell you if music effects the quality of my workout. Stay healthy and strong! Yeah, I wonder that also. Haha ear buds or not, it appears your program is working for you! Yeah I think listening to music definitely helps with speed and duration. You get lost in the song (if it’s a good one) and it distracts your body from getting tired. Listening to classical music while you read is supposed to increase your comprehension and in my expwerience I think it does. Maybe the music has a way of keeping you focused? If so what music does for reading comprehension should be transferrable to the focus your body needs to exercise at a highly efficient level? Fascinating stuff! I walk faster when listening to music I like. Good to hear from a walker. Thanks for the comment, Paige! We just had this conversation at our marathon training clinic last night! I’ll usually listen to music when I’m training alone, but when I’m out on a group run, I’ll opt to go without. I usually do races without too as I do think it helps me be more aware of what’s going on with my body. On a treadmill though? Music is a must! Oh glad to hear you discussed it as a group What was the general consensus? Yeah treadmill running needs an Ipod! Yep, seems to be the case. Music takes my mind off the fact that I find running boring (sorry all you running lovers), and I definitely run faster when a lively tune comes on. Good one, Esther. Thanks for the comment! Depends on your mood! I find that if I am super energetic then music really helps me, otherwise I think it can slow me down. Personally I hate hearing myself breathing and music usually helps me zone out and forget how out of breath I am. Yeah, very good points. Thanks, Andrew. ← Short ‘n’ healthful: why cherry concentrate might make you a better athlete.